Description: Comes bundled with Tetris, Game Link Cable and stereo headphones. Box Text: GAME BOY - COMPACT VIDEO GAME SYSTEM. 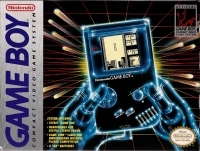 Game Boy- the state of the art compact video game system for portable, hand-held action!. 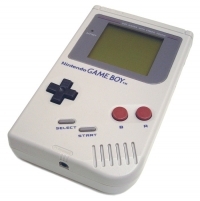 Completely self contained, Game Boy features patented Nintendo controls - cross key joystick, A, B, start and select buttons, plus screen contrast and volume control. Powerful CPU and micro-processors allow complex, scrolling backgrounds, hundreds of images and exciting play. Tetris game pak, stereo earphones and batteries included. Also includes Game Link cable for simultaneous multiple player competition. Interchangable game paks. This is the new generation of video game play - it's Game Boy. 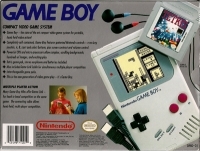 MULTIPLE PLAYER ACTION - Many Game Boy titles offer Game Link - for head to head competition on the same game. The connecting cable allows hand-held, multiplayer competition. This is a list of VGCollect users who have Nintendo Game Boy [NA] in their Collection. This is a list of VGCollect users who have Nintendo Game Boy [NA] in their Sell List. This is a list of VGCollect users who have Nintendo Game Boy [NA] in their Wish List.